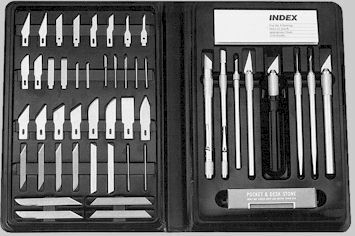 This set is ideal for cutting, scratching, etching, scraping, ceramics, layout work, model making, etc. Contains seven knives (#6, #7, #8, #14, #119, #123), a pin vase, 36 assorted blades, and a fine honing stone. All packed in a durable plastic carrying case. The price of the 268 Super Deluxe Set is $42.95. This set contains one each of #9 (1/4" diameter; 21 teeth/inch), #10 (1/4" diameter; 15 teeth/inch), and #12 (7/16" diameter, 15 teeth/inch) pounce wheels in a handy plastic case. The price of the 12-A Pounce Wheel Kit is $12.95. This set contains three tools for ruling fine, medium, or heavy line. The cutting edge on the scooper enables you to obtain sharp, clean lines without damaging the film. Great for ruling on negatives and for litho plate making. Kit has double-ended holder for full range of 8 needles. Five round needles ground on one side for removing emulsion form film to make different line widths on negative. One pointed needle and two square needles for gouges are also included. The price of the 22 Needle Cutters is $7.25. This all aluminum tool is perfect for fine work, scribing, re-touching, stencil, or perforating. It will hold drills up to 1/16" size. The pin retracts into the handle when not in use. The price of the 44 Pin Vise is $4.25, 44-P pins are $2.95. This tool has a wooden handle with a rounded end for burnishing and an end with a pin for cutting acetate, piercing shades, or self addressing headers and sheets. Comes packaged six to a blister card. The price of the 45 Stylus-Burnisher (set of 6) is $4.25. Sturdy all-aluminum handle with a choice of several styles of replacement blades. An outstanding tool for etching, scribing, re-touching, and many other tasks. The price of the 7 General Use Knife is $2.50. Useful for cutting and scoring paper, plastic, foil, or even fiberboard, This handy tool opens instantly to any one of three cutting positions. The retractable blade keeps the knife safe and sharp when not in use. It comes with five replaceable heavy duty alloy steel blades in the handle. The replacement blades are also available in packages of 5 or 100 blades. The price of the 855 Knife is $6.95. The 5 pack of replacement blades is 851-5 and is priced at $1.50, The 100 pack is 851-100 at $19.95. The 7-E blades, our most popular, are available in 5, 100, and 100 blade packs. The prices are 7E 5 for $1.50, 7E 100 for $19.95, and 7E 1000 for $159.95. A simple tool for any type of use. Precision ground and surgically sharp blade. Available in boxes of 100 blades. The price of the 9 Single Edge (100 blades) is $10.95.